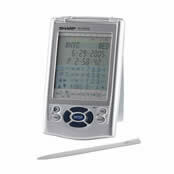 Sharp organizers are recognized all over the world as the device for getting organized. With the Sharp YO-P20HII pen touch organizer at your fingertips, you'll discover it has never been easier to store personal and business information. 1 MB memory allows you to store thousands of personal entries. PC-link cable & software are included for synchronization with Microsoft® Outlook® and data backup/restore. Enhanced English / Spanish Word Translator allows for approximately 20,000 English/Spanish word translations. tracks your daily intake and calories burned. Battery Life: -Approx. 6 months while Pedometer is set to on, with 5 minutes of data search, 55 minutes of data display, and 10000 step counts per day. -Approx. 5000 hours when data is continuously displayed with pedometer set to off. -Approx. 2000 hours when data is searched for 5 minutes and displayed for 55 minutes per hourly use with pedometer set to off. -Approx. 2 years when turned off and the clock is running with pedometer set to off. -Backlight Battery: Approx 4000 times when the backlight is turned on for 10 seconds and turned off for 50 seconds per minute while the display is activated. This page is part of GeneralManual.Com Network SHARP YO-P20HII Organizer PDA User Manual.